Everybody needs a friend--to take a walk, go for a swim, or share a hug with. 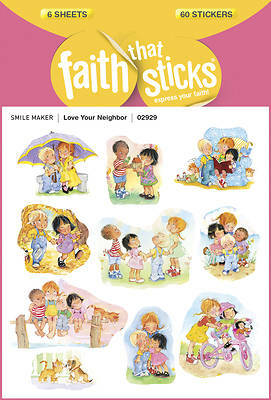 These adorable stickers highlight the sweetness of friendship, featuring both boys and girls and their animal friends. Use them to decorate a note to a special friend, create thank-you cards, or decorate books and papers. Kids will also appreciate any teacher or parent who uses these heartwarming buddies on homework, Sunday school papers, or class charts. All images are taken from Blessings Every Day by Carla Barnhill, illustrated by Elena Kucharik. Includes 6 sheets; 60 stickers total.